The beaches and warm weather of South Florida brings millions of visitors to its cities each year. South Florida spans the area from the Florida Keys through the top of Palm Beach County and includes famous cities such as Miami, Key West, Fort Lauderdale, Boca Raton, and West Palm Beach. With an estimated population of 6 million people, South Florida has seen considerable growth over the past three decades. It is an ethnically diverse population, with heavy influences from Cuba, Haiti, Puerto Rico, Columbia, and Venezuela spread throughout its multiple cities. Homes in South Florida range from single family homes in family neighborhoods to sprawling mansions on the intercoastal. There are hundreds of schools and parks located in the South Florida area, as well as shopping centers, restaurants, and businesses. In addition, South Florida offers a myriad of activities for tourists and residents alike. Whether it is enjoying the sunny weather on the beach or in a park, shopping at one of its many malls, dining at a waterfront restaurant, going to a museum or show, or just taking in the sights and sounds of the city, South Florida is a bustling location filled with things to do. Each year, residents of South Florida are injured in accidents. Many times, people are injured through no fault of their own. Injuries can occur when drivers don’t operate their vehicles with reasonable care or property owners don’t ensure that their premises is safe. If you have been the victim of an accident, contact the South Florida Personal Injury Lawyers at the Wolfson Law Firm. Injuries that result from accidents often impact a victim’s ability to work and causes them to incur high medical costs. Our South Florida Personal Injury lawyers can help answer your questions about paying for medical treatment and recovering lost wages. If you or a loved one has suffered injuries or a fatality as the result of a Personal Injury accident and would like to speak to our South Florida Personal Injury lawyers, contact the Wolfson Law Firm at (855) 982-2067 for a free consultation. Why Contact a Personal Injury Accident Attorney in South Florida? Wondering if you have a case? Have questions? Contact Wolfson Law Firm at (855) 982-2067 for a free consultation. Personal injury claims can arise from injuries received in motor vehicle accidents, slip and fall accidents, workplace accidents, as well as medical malpractice, defective products. Broken bones, scarring, and burns are common injuries. Although they may seem minor, these injuries can often require significant medical treatment. 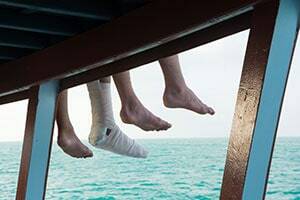 Broken bones: Depending upon the location and the extent of the break, broken bones can require surgery and result in a longer hospital stay. Broken bones may limit mobility and often require months of physical rehabilitation. Burns: These are painful injuries that can remove layers of skin. Second degree and third-degree burns can take weeks to heal and carry a risk of infection. Scarring is a possibility, depending upon the extent of the burn. Scarring: Extensive scarring can require skin grafts or revision surgery. In some cases, the victim could have a permanent disfigurement. Accidents can cause serious injury to the neck or head. Neck injuries: Whiplash is the most common neck injury and occurs when the head is suddenly jerked forward and back in an accident. Although the injury may not be apparent when the accident occurs, whiplash can injure ligaments, discs, and joints in the neck causing significant pain. Serious neck injuries include neck sprains or breaks or a crushed vertebra. Head injuries: Head injuries are often the result of concussions or trauma. Concussions: Often caused by the sudden jerking or rotation of the head. They can cause blurry vision, confusion, nausea, or memory loss and may lead to more serious injuries if not treated quickly. Trauma: Direct brain trauma can occur when the brain hits a hard surface through the skull. This can occur in slip and fall accidents when the head hits the floor or motor vehicle accidents if the head hits the window or steering wheel. This trauma can lead to bleeding or bruising of the brain. Indirect brain trauma is often the result of the head shaking violently, as in a whiplash injury, causing damage to nerve cells which can lead to severe damage to the brain. Injuries sustained by accident victims can be extensive, possibly permanent. Even those that seem relatively minor can incur significant medical costs and require future care. Injuries may also impact your ability to work, thus resulting in lost wages. The financial burden placed upon families can be overwhelming, especially when the injured party is the primary income provider. Seeking representation will help Personal Injury accident victims to receive the compensation they need to recover from an accident and restore their lives. If you or your loved one has been the victim of a Personal Injury accident, contact the South Florida Personal Injury accident lawyers at The Wolfson Law Firm at (305) 285-1115 for help. The South Florida Personal Injury accident attorneys at The Wolfson Law Firm can help you and your family to get on the path of recovery. We can answer your questions. We can help you – so call now.